Tuesday, 12 March 2019, 3:43p.m. After five months enjoying Auckland streets to itself, Lime e-scooters now have a rival. Wave scooters will be on Auckland streets from Wednesday morning, with 285 initially. It will cost $1 upfront, then 30 cents a minute, to ride a Wave, founder and managing director Albert Hoeft says, matching Lime's pricing. Wave will also have a voluntary 15km speed limit in certain areas of Auckland's CBD. Hoeft told Larry Williams that this will be achieved using GPS technology that will cap its scooters' speed in the restricted areas. "It won't be a sudden stop, it will a steady decline from 25km (the max speed) to 15km." He says that the speed limit was part of their safety campaign, something they wished to highlight after the high number of injuries in New Zealand since Lime launched. "We will do the opposite and promote safe riding." Hoeft says they he does not think it makes sense for people on e-scooters to ride on footpaths at speeds of 25km/h, though he is not sold on helmets. 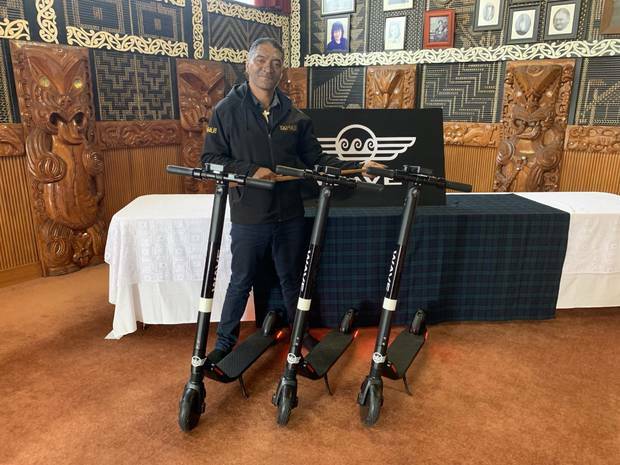 Wave recently secured a permit with Auckland Council to operate 1000 scooters (the same number as Lime) in Auckland city central and outer suburbs, and initially put 500 scooters on the city's streets. Although tiny, Wave has jump-started its operation by licensing a scooter design, technology and app from US e-scooter giant Bird, which is valued around the US$2 billion mark, putting it neck-and-neck with Lime. There were two managers from Bird on-hand for today's launch, which represents its first foray into licensing. 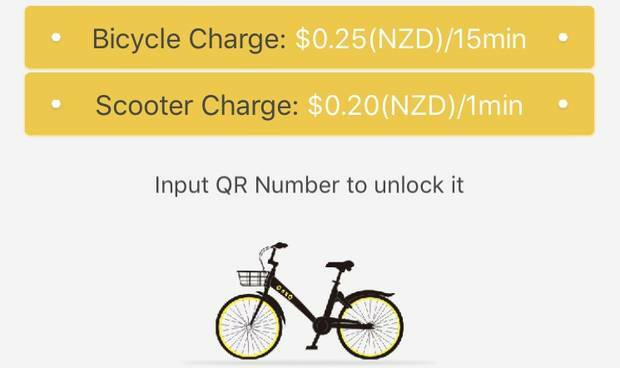 Meanwhile, bike-sharing operator Onzo has just added a 20c/minute scooter button to its app, hinting that its long-promised e-scooter launch could be close - and undercut its rivals. Onzo already has permission to join Auckland's e-scooter trial. "Wave will be restricting its scooters to 15km/h on Queen Street, and in the Wynyard Quarter and Viaduct Basin areas. "This is a good opportunity for us to test slower speeds in areas with lots of people walking," he says. There are now three trial e-scooter operators licensed for Auckland: the San Francisco-based multinational Lime, which enjoys hundreds of millions in backing from key investors Uber and Google; the Brisbane-registered Wave - which bills itself as Australia's first scooter-sharing startup and lists 10 employees on its LinkedIn page - and local contender Onzo, which is yet to say if or when it will put scooters on streets to complement its bikes. Hoeft says they are looking at launching in Christchurch and Dunedin. He said although his company had been founded across the Tasman, Auckland was its first city and he considered it a Kiwi company. He says that Auckland is their top priority at the moment. The launch comes after Lime e-scooters were recently pulled from Auckland and Zurich streets, and to a wave of bad publicity in the US, after being hit by a braking issue that caused 31 injuries locally. After a week's absence, Limes returned to Auckland on March 1, with a new requirement to report safety issues within 48 hours. Hoeft did not want to comment on regulation of Lime scooters. He does not think that their speed limit will inhibit them. "We want this to be a sustainable mobility solution for Auckland city. If someone wants to go 27k, ride a Lime, we don't care. We're going to promote safety." Ellison said that similar problems have not been reported with Wave scooters. "Wave has also assured us that its model of scooter, which is used in other countries, has had no reports of brakes locking, or any other known issues," Ellison said. "It has also provided assurance that it will recall its fleet immediately if any malfunctions occur, until these issues are addressed."